BioCare is an economical, fast acting all purpose non-rinse cleaner for floors, kitchens, toilets and drain maintenance. It eliminates slippery floors caused by grease build-up. Effectively cleans floor grout, crevices and corners without effort and reduces insect infestations such as ants and other pests. It eliminates pets and animal waste odours leaving a fresh clean environment. 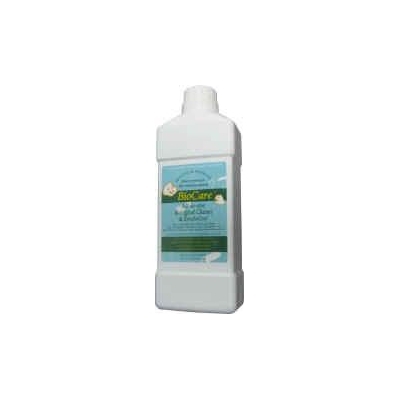 APPLICATION: Add 25ml to 50ml (1 to 2 caps) to 10 litres of water, mop thoroughly on floor surface and allow to dry. After cleaning has been completed, simply dispose remaining water into drains or sinks to remove build-up throughout the plumbing lines of entire building and sewerage systems.